I missed this post, but I'm glad I stopped by Kathy Sheehan place on AR to get the news. Stephen Covey impacted a lot of lives and created fresh ways of thinking about organization and getting our days done. I still remember reading The Seven Habits of Highly Effective People and going to a company class to learn how to use the Franklin Planner. Like so many others Covey's ideas are simple but powerful. This morning I read that Stephen Covey died yesterday due to complications from an April bike accident. 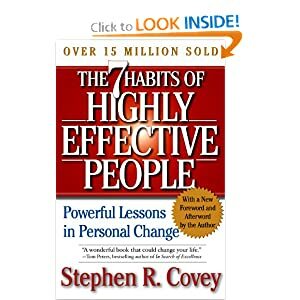 "The 7 Habits of Highly Effective People" published in 1989 was on bestseller lists for four years. It sold in excess of 20 million copies in 40 languages. He had a multi-million dollar business empire that markets audiotapes, training seminars and organizing aids aimed at improving personal productivity and professional success. He personally trained corporate executives and politicians. I know personally that I have been inspired by his books. There isn't a day that goes by where I don't think about "win-win", "sharpen the saw", "be proactive", "begin with the end in mind". He certainly made an impact on many and left a legacy that will inspire generations to come. If you have never read "The 7 Habits of Highly Effective People" I would sincerely recommend it! If you found this blog valuable, please subscribe by clicking the button to the right. If you are ready to talk about a mortgage, please click HERE to apply now. Like what you saw, please SUBSCRIBE to my blog!